In a first for Porirua City two pint-sized future leaders from all 32 primary schools in the city were given a boost with awards for leadership. The two Rotary Clubs of Plimmerton and Porirua, NZ, together with Porirua City Council, recognised 64 Porirua primary school children who have shown leadership, served others and acted as role models. The awards were presented at a special function on September 21, 2015 at Pataka Museum. 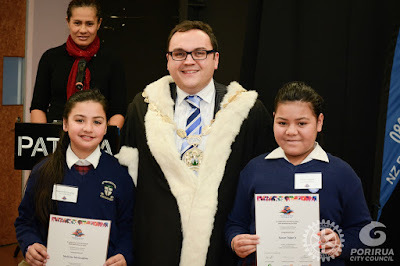 Besides the award recipients, a large number of parents, principals, teachers and family were present, along with many of the prefects from Porirua City’s colleges, plus most Porirua City Councillors and senior Council staff. Councillor Izzy Ford said it was appropriate that Mayor Nick Leggett present the awards, as he was Porirua’s youngest ever Mayor. The Mayor assured all awardees that the City was immensely proud of their achievements in the 50th Anniversary year of the formation of Porirua City, the year in which Porirua City Council had made children one of its strategic priorities. Mana Minister of Parliament Kris Faafoi said the awards showed that Porirua had an exciting future ahead of it with so many impressive young people. "It's great to see our future leaders encouraged and recognised as part of the 50th celebrations,” he said. “When our city turns 100, many of them will have done an enormous amount for the city. When we think of it in those terms it's wonderful that we are building on their natural leadership ability." After receiving their certificates to enthusiastic applause, each pair of award winners had their photo taken with the Mayor in his full mayoral regalia, and all were clearly thrilled by the occasion. An address was then given by Liam Dalton, Academic Prefect at Aotea College. Liam explained to award winners that a good way to make progress in life was to learn how to hold a conversation with someone new, to listen, to smile, and ask questions. Liam told his young audience that achieving good grades at school was not the complete answer to being successful. “School is not the only place you learn. Step out of your comfort zone and try new things. Make the most of every opportunity, and be the change you want to see in the world. Each one of you is an extraordinary human being”.